Real Madrid and Wales forward Gareth Bale. 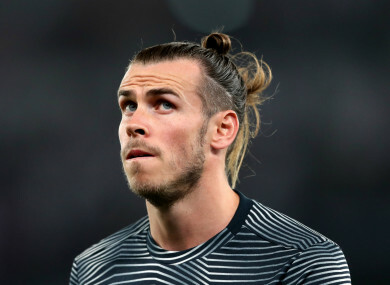 SANTIAGO SOLARI SAYS he will deal with Gareth Bale in private after the Real Madrid forward reportedly left their loss to Real Sociedad early. Bale was not in the squad for Sunday’s 2-0 La Liga defeat at the Santiago Bernabeu as the Wales international is sidelined by a calf injury. But with Madrid slipping to a sixth La Liga loss of the season, Bale was pictured driving away from the stadium with more than 10 minutes to go. Although Bale starred at the Club World Cup with a hat-trick in the semi-final against Kashima Antlers, his La Liga form has been mixed. The 29-year-old has only scored one league goal since 1 September and has again been linked with a move away from Madrid. Solari, though, would not reveal whether or not Bale will be punished for leaving the Sociedad match before full time, when he spoke to reporters ahead of Wednesday’s Copa del Rey tie at home to Leganes. “The fact that Bale left the Bernabeu is something to be solved inside the dressing room,” Solari told a news conference. Solari was left frustrated by VAR after the technology was not used to award Vinicius Jr a penalty during his side’s defeat to La Real, which left Madrid fifth in the table and 10 points behind leaders Barcelona. And the under-pressure coach again hit out at the use of VAR ahead of Leganes’ visit for the first leg of their last-16 tie. “It all depends on the rules being more clear than the technology,” he added. If the rules are applied in the same way then it doesn’t really clear things up. “Sometimes as a spectator, I don’t understand how it works. They will perfect it. Solari is unsure whether Brahim Diaz, who joined the club from Manchester City this week, will be available to face Leganes. “Brahim is fine, very happy to join Real Madrid,” he continued. ”He made a great choice picking the number 21 [also worn by Solari at Madrid]. Email “Gareth Bale issue an internal matter, says Real Madrid manager”. Feedback on “Gareth Bale issue an internal matter, says Real Madrid manager”.